Leeds United brought a productive transfer window to a quiet end last night, wrapping up the signing of Jordan Botaka but deciding against a deal for Watford’s Lloyd Dyer. The Elland Road club turned their attention to 32-year-old Dyer in the hours before yesterday’s 6pm deadline but opted to stick with their squad after making Botaka their eighth and last recruit of the summer. Botaka signed a two-year contract at Elland Road and then flew out of England to link up with Congo’s squad ahead of an international fixture later this week. The 22-year-old, who joined Leeds from Dutch top-flight club Excelsior in a deal worth around £1m, will return to Yorkshire to train with Uwe Rosler’s players ahead of United’s next league game at home to Brentford on September 12. His contract gives Leeds the right to extend it by a further two years, in effect tying Botaka down until 2019 if the winger impresses during the next two seasons. Botaka said: “I am very happy. It happened very fast. In two or three days everything was arranged. It was just crazy. His transfer from Holland was finalised well in advance of yesterday’s deadline but Leeds considered a number of last-ditch options in the market, including Watford veteran Dyer. United were understood to be interested in taking the former West Bromwich Albion and Leicester City player on loan with a view to a permanent move but the transfer failed to materialise. Leeds also cast their eye over Nottingham Forest’s Jamie Paterson and briefly considered returning to Sunderland for Will Buckley before drawing a line under their business. £5m in their squad this summer, including a major deal for striker Chris Wood from Leicester City. 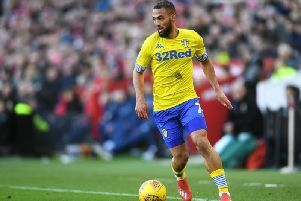 League One Coventry City, meanwhile, showed a late interest in forward Nicky Ajose but the 23-year-old remains on the books at Elland Road, despite having no place in Rosler’s plans.